Weddings at Holkham Hall01328 713108work Wedding Reception VenueHolkham Hall is licensed for civil ceremonies in four of its magnificent state rooms. 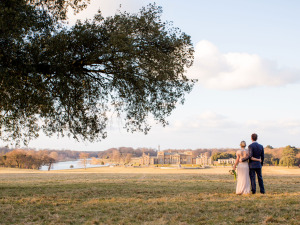 Holkham Hall is one of the grandest and most beautiful wedding venues in the country and offers the perfect location to get married in north Norfolk. Home to the Earls of Leicester, this fine Palladian house, surrounded by a romantic deer park with a lake, temple and woodland, could be yours for the day. We can cater for wedding ceremonies and civil partnerships, with four of the luxurious rooms in the hall offering a variety of impressive settings. Choose from the grandeur of the Saloon, the magnificent Marble Hall, the Statue Gallery with its unique classical collection or the intimate setting of the North Dining Room. Tucked away in the woodland of Holkham park, the secluded Temple is set in an idyllic location and is also available for ceremonies, with guests able to make use of both the inside and outside space to cater for larger numbers. Following your ceremony, there are many options for wedding receptions and parties. Drinks and canapés can be served in the state rooms in the hall and The Lady Elizabeth Wing provides a perfect venue for receptions and parties. Alternatively, the 18th century secluded walled garden to the west of the hall, the panoramic landscape of Holkham park and the picturesque Temple all provide perfect opportunities for marquee receptions. Holkham Hall is licensed for civil ceremonies in four of its magnificent state rooms. Our friendly and experienced team will help you plan your special day offering flexibility, support and guidance. We know the best suppliers to help you with a stunning marquee, delicious food, perfect flowers and memorable photography. We will be there to support you but you are free to design your day, from the ceremony to the reception, as you wish.